Bacteria become resistant to aminoglycosides by destroying them or changing their target. Small subunit of a bacterial ribosome with paromomycin (red), streptomycin (not visible in the figure), and spectinomycin (orange). A small piece of the messenger RNA is shown in green. We are newcomers to the fight against bacteria: other organisms have been forced to protect themselves from infection for millions of years. This fact is a boon for the medical community, because we can look to nature to find new antibiotics. In the 1940s, the antibiotic streptomycin was discovered in soil-dwelling bacteria, and quickly pressed into service to fight tuberculosis. In the following decades, the medical community discovered and designed ever more potent versions of it, such as neomycin and paromomycin, as pathogenic bacteria rapidly became resistant first to streptomycin, then to the more advanced versions of it. 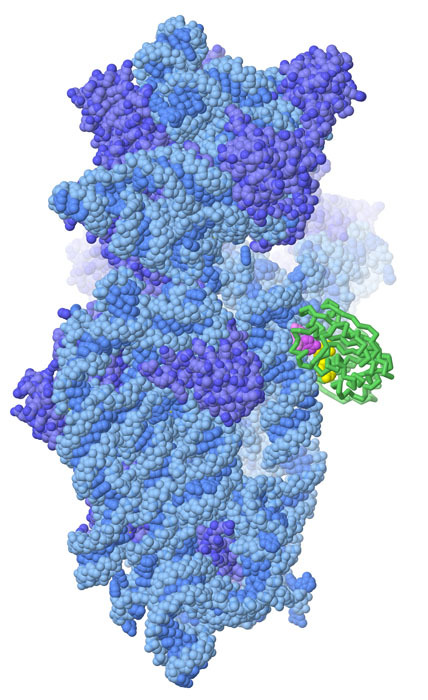 Structures of the small ribosomal subunit have revealed how aminoglycosides work. 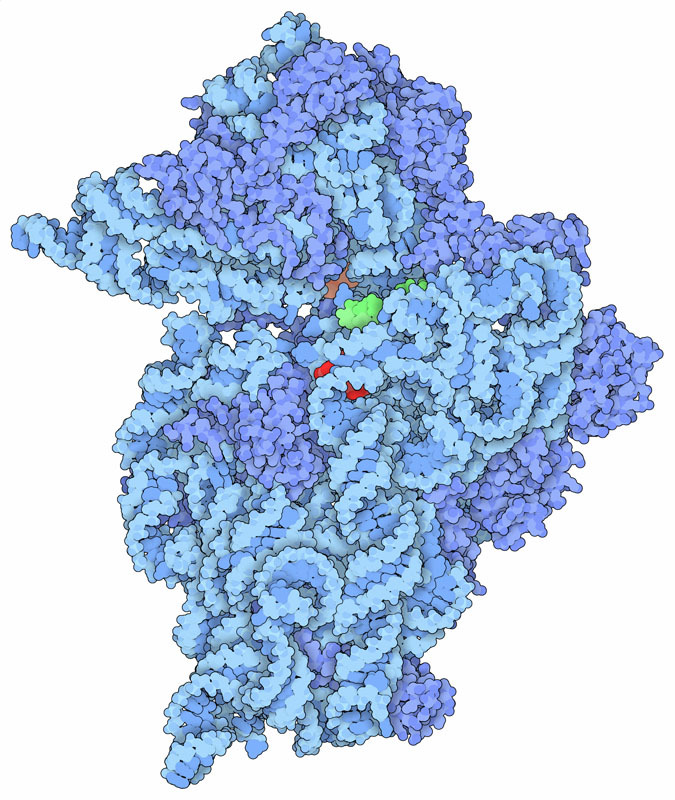 The one shown here (PDB entry 1fjg) is a complex with three antibiotics. Paromomycin is bound to a long RNA double helix that is involved in testing the fit of transfer RNA to messenger RNA, and streptomycin binds just behind it in a neighboring site. This structure also includes spectinomycin, which blocks a later step in the synthesis of proteins, when elongation factor G is moving the mRNA to the next codon. Aminoglycoside antibiotics bind to a region of the ribosome that is involved in translating the genetic code, where the proper transfer RNA is paired with a messenger RNA codon. Aminoglycosides perturb the subtle motions that are needed to ensure that only correct pairings are made, often causing mispairings and consequently introducing mutations into the proteins that are made (see the Molecule of the Month for February 2012 for a closer look at this interaction). These faulty proteins are thought to build up, corrupting the function of the bacterium and ultimately causing it to die. A methyltransferase enzyme (green) modifying a nucleotide in the small ribosomal subunit (blue). The enzyme has flipped out one nucleotide (magenta) and uses a cofactor (yellow) to provide the methyl group. This illustration was created with JSmol. As with other antibiotics, bacteria have evolved (and shared with one another) many ways to fight back and become resistant to aminoglycosides. A particular adenine in the ribosome, A1408, is important in the tRNA-mRNA decoding process and is a target for aminoglycosides like paromomycin. Bacteria can become resistant by modifying this adenine by adding a methyl group to it, so that paromomycin cannot bind but the ribosome still works properly in protein synthesis. PDB entry 4ox9 shows how a specific methyltransferase enzyme flips out the adenine as it adds the methyl group. Aminoglycosides have several amine and hydroxyl groups that are essential for binding to RNA. To become resistant, bacteria commonly attack the drug itself, using dedicated aminoglycoside-modifying enzymes to add new chemical groups to these amines and hydroxyls so that the drug can no longer bind and perform its error-promoting function. The enzyme shown here adds a nucleotide to the drug. PDB entries 5cfs and 5cfu catch the enzyme before and after the reaction. To explore this enzyme in more detail, click on the image for an interactive JSmol. In the search for new aminoglycosides, structural biologists have often studied just the target helix from the ribosome. For example, you can find many of these structures by searching for “neomycin” or “paromomycin” at the RCSB PDB site. You can explore the structure and properties of aminoglycoside antibiotics themselves on their “Ligand” page, for example, for streptomycin or paromomycin. B Becker & MA Cooper (2013) Aminoglycoside antibiotics in the 21st century. ACS Chemical Biology 8, 105-115.